Where do you suppose those spilling rainbows are coming from..or why they terminate so early? Opening remarks show us Winter is on the way, and an interesting point Dash makes is that Cloudsdale moving closer to Ponyville is indicative of the changing of seasons. 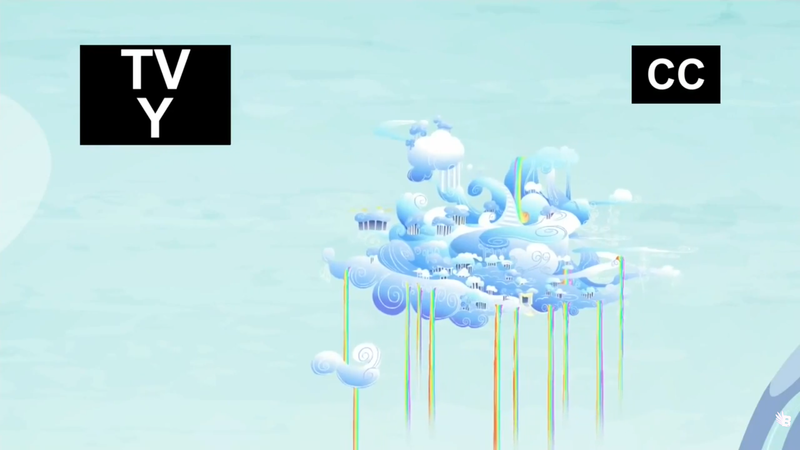 This seems to re-inforce the idea that Cloudsdale isn’t entirely stationary all the itme, though we haven’t honestly had any elaboration on it’s flight patterns (Is it like the Floating island on Mobius with a constant path or is it similar to the traveling weather platform?) 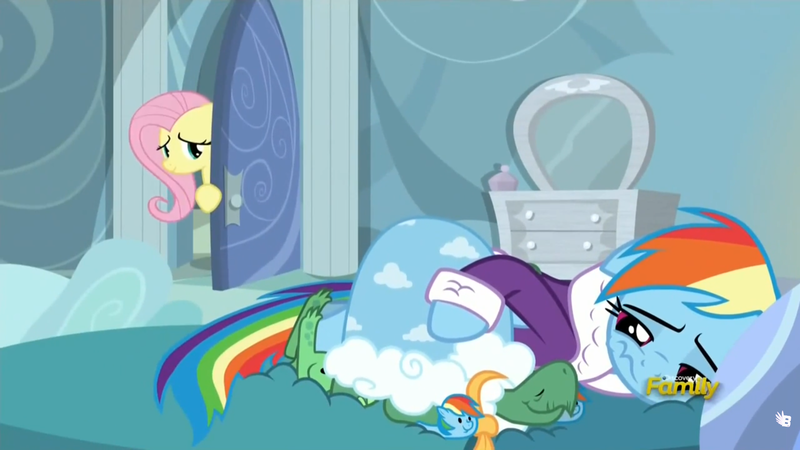 After we establish this is a Rainbow Dash/Tank episode we find out the main theme of this show is Tank having to go and hibernate. This opens the portal for the writers to tell viewers a great deal about denial, and personally, I see this episode being about Death. Yes, I’m hearing ALOT of backlash from that idea so far, but, I think it’s on a fundamental level about death and I’ll tell you why as I go! Stay with me I didn’t pull it outta my rear. You obviously don’t know a THING about animals. I’m going to get a second opinion, then ignore it also! She starts snapping at everyone who dares bring up the idea of Tank leaving at all or the concept of them being seperated. The very MENTION of the word ‘hibernate’ sends her into a spin. Interestingly still is that she cannot bring herself to even SAY the word. Where we will do ANYTHING to keep our loved ones alive, bring them back, or keep them from leaving. The last one applies here of course. Dash comes to the final conclusion that if Tank hibernates in the winter, then she just needs to stop winter. Totally reasonable! Right? 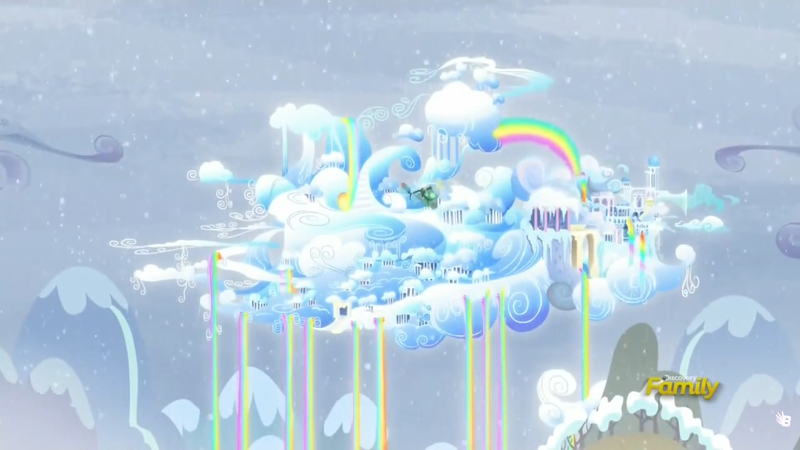 So, Rainbow Dash and the ever more sleepy each scene Tank head to Cloudsdale, the headquarters of all weather, and head to the winter section of the factories. Several moments in the new set make me want to know where the Rainbows are made. 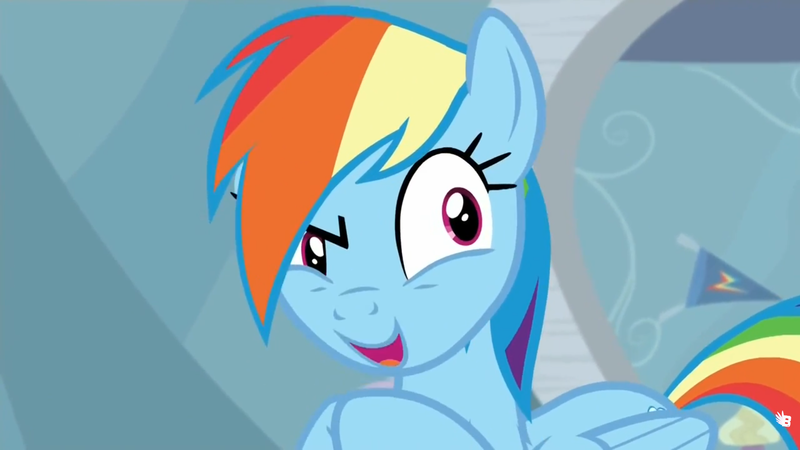 Those of you who read “Cupcakes” and “Rainbow Factory” will chuckle at that idea of Dashie running smack into the heart of the dreaded Rainbow Wing. 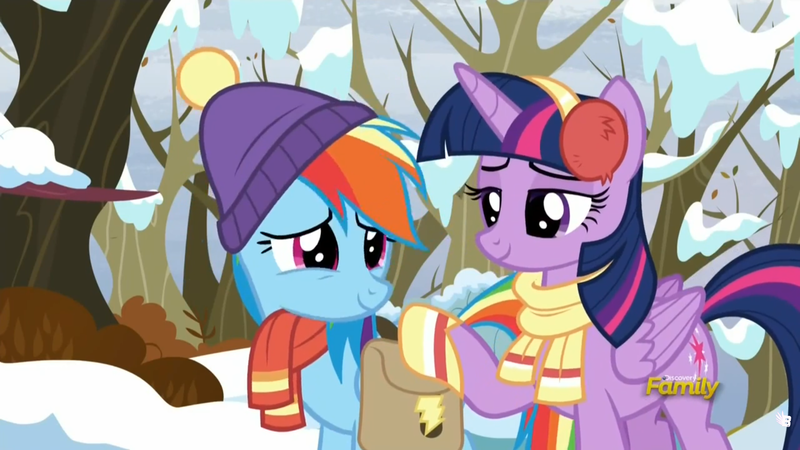 A set of almost Acme / Warner Bros chaos ensues and Dashie overloads the factory inadvertently creating one GIANT dose of…well…winter! 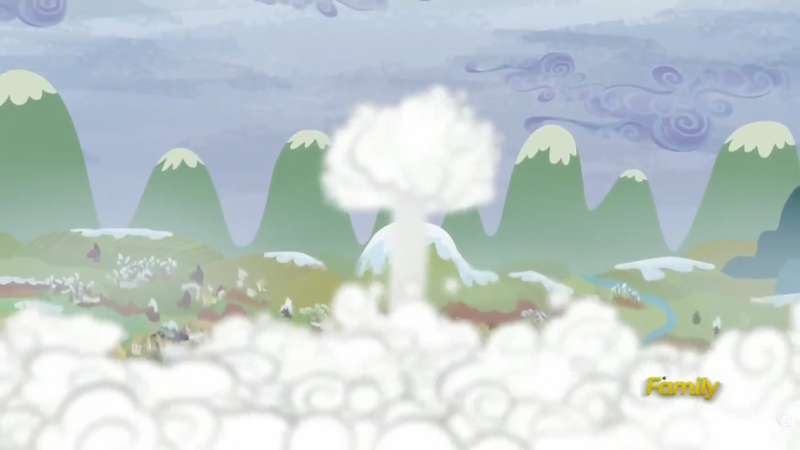 In the form of a giant snowball it fires forth from Cloudsdale and hits Ponyville and gives new meaning to the term “Nuclear Winter”. She bawls at the final realization that Tank is going to die and there’s nothing she can do to stop it. I mean that Tank is going to leave for a while and there’s nothing she can do to stop it. It’s very humanizing to see this finally hit one of our characters, personally I find them much more real when faced with situations that humble them from this world of Happy Happy. 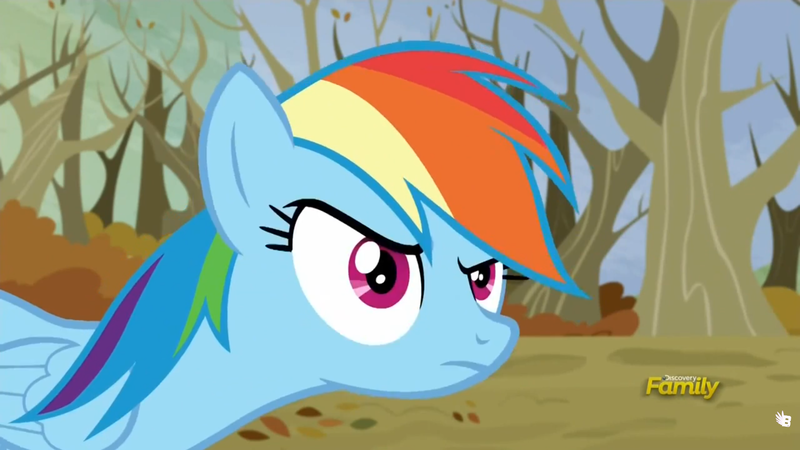 This really was a tear jerky for some on Twitter from what I read, some folks were very upset the writers hurt Dashie. The voice actress even took me by surprise on the oddly realistic portrayal of a pony having to say goodbye to her friend for months. Well done! Finally, after this long 30 odd minute train of Denial, Anger, Bargaining, and Depression…we hit the final stage. The one we hit when we finally realize our Uncle or Cousin or Mother or Best Friend just isn’t going to come back. Dead is dead. You need to let go and despite the fact Dashie is as Awesome as She Wants to be she’s still emotionally driven like most of us. She gets through the stages quicker then most of us who are awesome 😉 (Heck, Darth Vader takes WAY longer then Dashie). She brings the very sleepy Tank to a place near a pond, where he bids her farewell and she sits with him until he goes to sleep. So, sure one could say this episode is about Acceptance, and I wouldn’t really argue against that, but personally I see this entire episode about what we go through with Death. 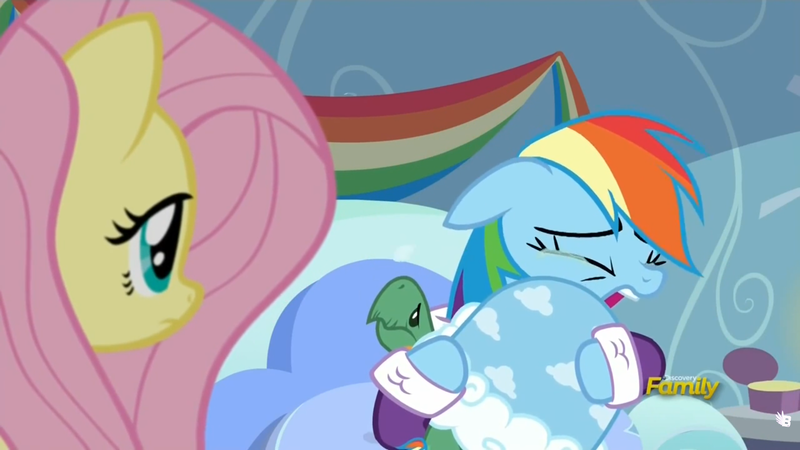 Rainbow Dash’s reactions are very close to those of a near-psychotic break but despite that, her friends are there to help her, playing into the entire overall arc of Friendship being point in fact, Magic. The song was nice too, I enjoy the harmonic style that’s present, not sure what it is, despite it being a solo piece, she’s singing with herself several different layers of her voice if I hear it correctly. Stay tuned, I’ll be doing these faster and faster! Like Me, Post me, Hit me with your thoughts on anything and more! So here we are, second real episode into Season five! Lets see what they’ve decided to give us to make our brains go “ooo” and “ahhh”! Those of you out there reading this should know I’m a fan of the show, and my remarks are meant to be in good taste and not meant to bring the show down for the most part! 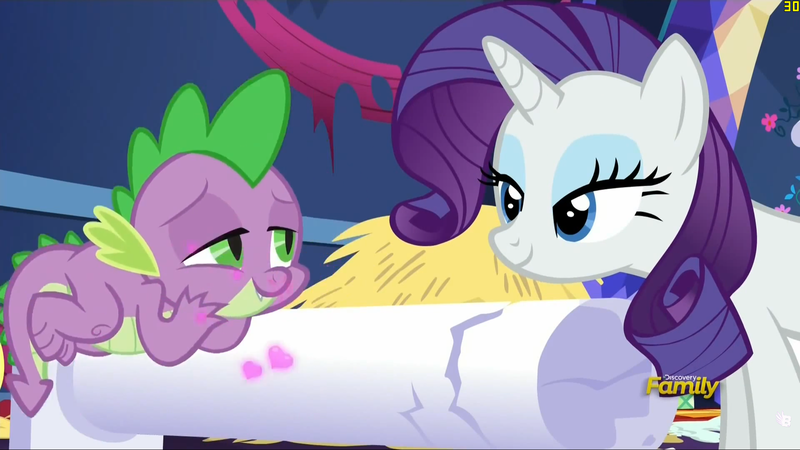 So we start out in the Cutie Mark Crusaders Treehouse, where we learn that Babs Seed has earned her own cutie mark (scissors oddly enough). They go on to discuss what a majority of us tend to run into when we think about the idea of the CMC is that once you get your breasts cutie mark, your NOT part of the group anymore. This of course scares Applebloom as no doubt she doesn’t want to go back to being a single string guest star! On the other hand I swear I hear the girls a bit older in their voices, intentionally or not, it’s nice to see progress as I do hate a Static time line. As Applebloom and Applejack discuss the inevitable conclusions I spoke of above, they settle in for a nice summer’s nap. Now as most of our veteran viewers can remember, we haven’t had a nightmare episode for Applebloom. Previously we had Scootaloo camping and being chased by the headless horse and Sweetie Belle’s episode was the weaker of the two. So of course from a literary standpoint we all must have come to the conclusion by now that this is the third and final one before we either dive into babs or all three in a 80’s style tribute to the explorers dreamscape. AJ and Applebloom share a lovely moment and AJ’s singing reminds me why I like her voice overall. The pest in question is called, get this, “Twittermites”. I can’t help but think about how the writers threw that one around describing these. The more spread out they get the worst they get, the more you have the more powerful, ect. It’s an interesting commentary on Twitter itself. Mindless insects that alone are fine and almost cute, but you get ALOT of them they do repairable damage. So a quite cameo of Diamond Tiara and Silver Spoon leads to Bloom caving to peer pressure again and inadvertently unleasing Twitter on the entire town of Ponyville! Bloom makes her way to a forest area where a mysterious voice offers to help her, and she has it wipe off her mark. NEVER trust mysterious voices kids. What was interesting was that Applebloom starts to TRY and fix her mistake but oddly enough, she’s told NOT to even try since she doesn’t have a cutie mark for the job. I’m not entirely sure what to make of this on a subconscious level that we’re watching this on. Does Applebloom truly think you can’t do ANYTHING unless your mark tells you? So, Round 2, she wakes up, and fragments of her mind seep in and slowly manipulate the “reality” she’s in. Like reloading a save, the entire setup from before plays out and she and Applejack have breakfast this time is more flamboyant. 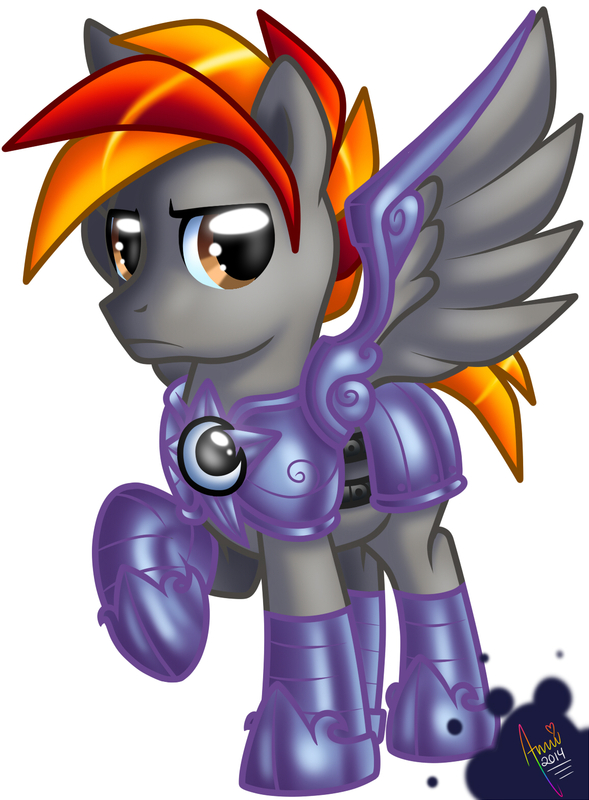 The dream lampoons the entire thought I had regarding CMC. The moment ONE of them got a mark, it would shatter their friendship entirely. So that of course means we ask the stranger for help again, taking it away. THIS time the other two now have their marks and tell her to go away, much like DT and Silver Spoon would act. The interesting deep level here is we as the audience and thus AB never SEE the marks Scoots and Bell claim to have, leading to the conclusion that it’s not the cutie mark that AB fears the most, it’s the isolation and rejection that may come with it. She doesn’t NEED to see the mark nor would her mind make one up for her, it’s the emotions tied to it. Round 3, she wakes up again, by this time we’re all aware of the dream so the writers tip their hand. Breakfast is just insane this time and Applejack, much like a poorly scripted bot, says exactly the same thing despite AB now very concerned about the whole situation. A humorous Mix-Mash of AJ, Big mac and Granny occurs and AB screams herself awake for fear of rejection and exile from her family. The subtext here is that as she’s spiraling toward consciousness, her mind’s losing control of making coherent pictures, so Big Mac’s voice comes from AJ, Granny says Mac’s line, and as such she doesn’t notice as structured thinking is slipping from her. Round 4 she wakes up (yeah right, this is a reminder of the intro to Freddy’s Dead: The Final Nightmare :P) and has HAD it with the entire waking up and not waking up issue, and just as quickly solid reality fades and she confronts this stranger who keeps helping her. 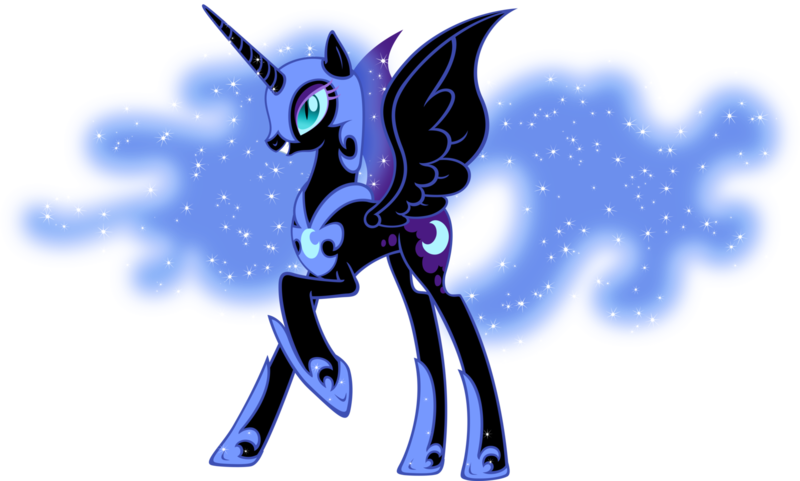 Thankfully since this IS a dream, most veterans watching should know that Princess Luna isn’t far behind (and I do love me some Luna :P) and she sheds some moonlight on the subject. It turns out the stranger / shadow IS Appleblooms own projection of fear. The overall lesson we’re to learn here is in the end YOU tend to be your own worst obstacle. 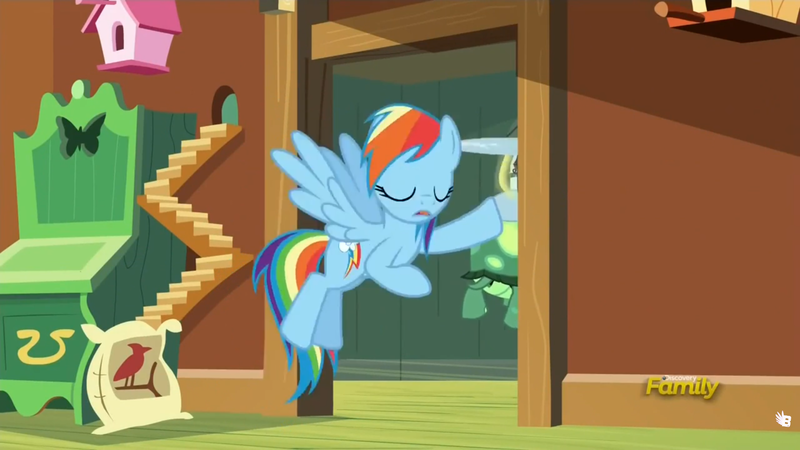 Then we get a barrage of doors that reminds us of the Matrix and we peak in on Sweetie Bell and Scoot who are having the same issues as Bloom is having. (I love that Rarity gives Bell a 1.0) We see that Luna is watching everyone’s dreams, which is kinda creepy, but oddly comforting. The real question I have there is if she’s awake and watching over Canterlot / Equestria via that ledge and telescope, does she also project herself in two places at once? So to wrap up the entire issue, Luna decides to bring all three to a Dream version of the clubhouse (which has..ALOT of Rainbow Dash Merchandise) and they decide to make sure that no matter what mark they get when or where, they will of course remain friends. Overall I give this a 7 out of 10 (bonus for Luna speaking <3) and I think this is a nice book end to our nightmare episodes of the CMC. I can’t wait till once of them get a mark and we see how well in execution the plan works. So here we are, the first real episode of season 5 and oddly, it starts out like season 4: centering around a castle! The girls then get to work making the place feel homey and inviting, which naturally means we need to break into song! Which we do, though Rainbow Dash leads us in this time, refreshing change. Overall the song isn’t horrifically long, in poor juvenile taste, or painful to watch as the style and construction has honestly come a long way compared to previous seasons. Sadly we see that once again, without Twilight’s leadership aura that apparently is only effective if she’s within 40 meters, the girls end up decorating the castle in their own style, completely missing the point of what they intended to do, which was to make it more inviting to Twilight. We can forgive this as we haven’t even gotten to a real second act and we can feel the pacing, at least I could. 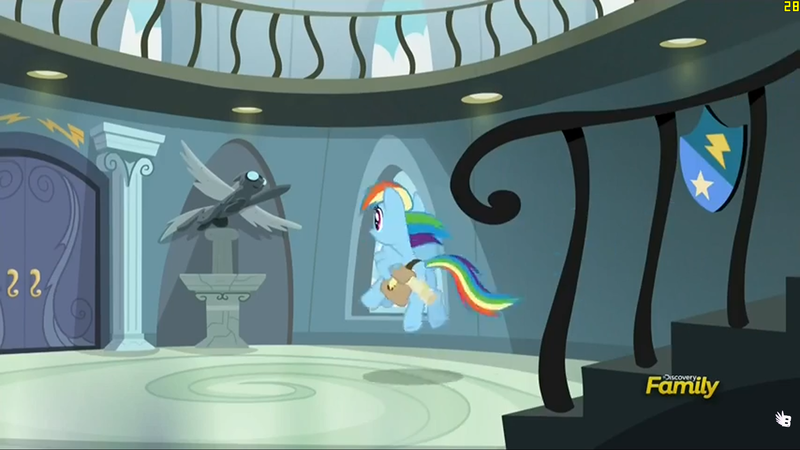 Incidentally I wonder if I could get a real life version of that Wonderbolt statue we see in Rainbow Dash’s rarely seen house interior? So the song ends with a wide shot of the Map of Equestria that looks suspiciously like a Skyrim Mod that needs to be made (Or for that matter already has been, I seem to recall riding a giant Derpy in Skyrim at one point so who knows WHAT’S been made already?) and the reality of their futile effort sets in. Rarity’s Bridzilla trait kicks in and everything falls apart without Twilight’s paragraph long monologues. If you look close enough you SHOULD be able to see Winterhold! It should be worth noting that in order to buy some more time for another revision, Rarity AGAIN takes advantage of Spike. I’m beginning not to like her at all, what is that like 5 major times she’s knowing strung him along? There’s a lesson for the kids watching. :/ Hopefully we’ll get an episode where it comes full circle and is properly addressed. 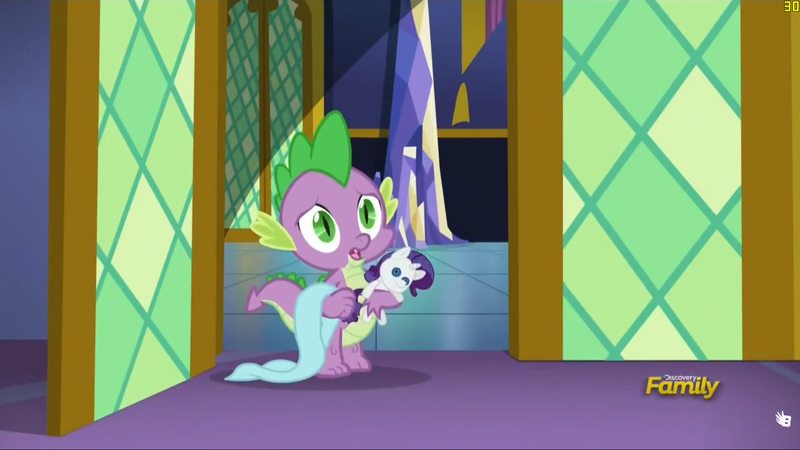 Meanwhile on the B side of the episode, we see Twilight and Spike at the Spa. Here’s another thing that stuck out in my head was that for a world that’s moving at the same speed as Equestria Girls World, their technology is radically skewed. We see a dryer for her hair that no doubt requires Post-Industrial technology, yet they still haven’t harnessed the power of the internal combustion engine. This re-enforces my theory on technology purposefully being held back by higher ups. Overall I enjoyed this episode, I’d give it a 5 out of 10, average, but not horrible. I’ll just leave you all to comment and hopefully stir up CONSTRUCTIVE debate or words of anytype! 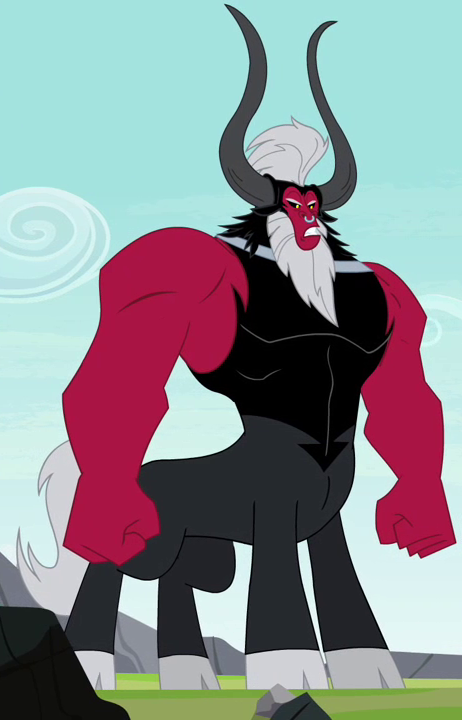 So last post I did a quick review of the basic villains from the my little pony friendship is magic seasons. 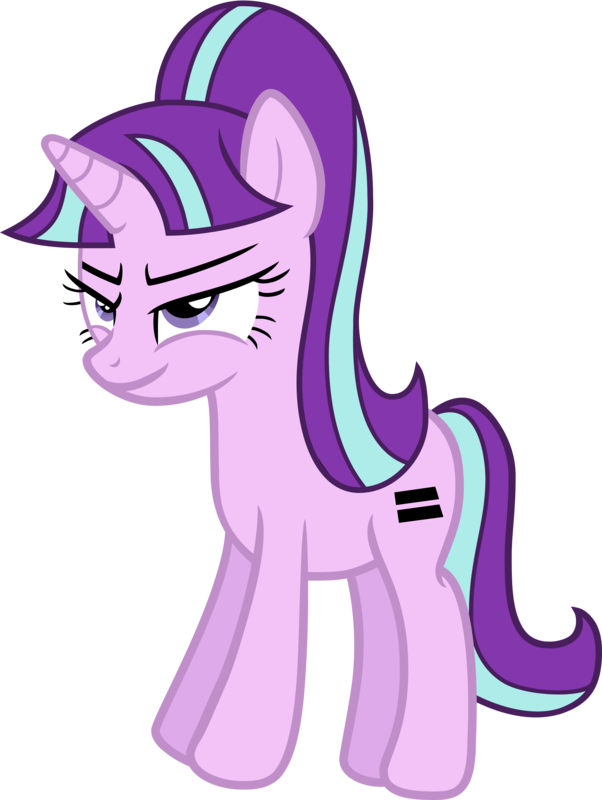 I stopped short of season five’s first villain, Starlight Glimmer. As I touched base on before the writing team has either gotten better at their craft or has finally been given more rope to run with this season. Reason being this villain is a step in the right direction. Why you may ask? I’ll tell you why in a moment. First two more quick stops down memory lane. I know not everyone enjoyed the Equestria Girl movies; but I did. Mainly due to the villains in each. 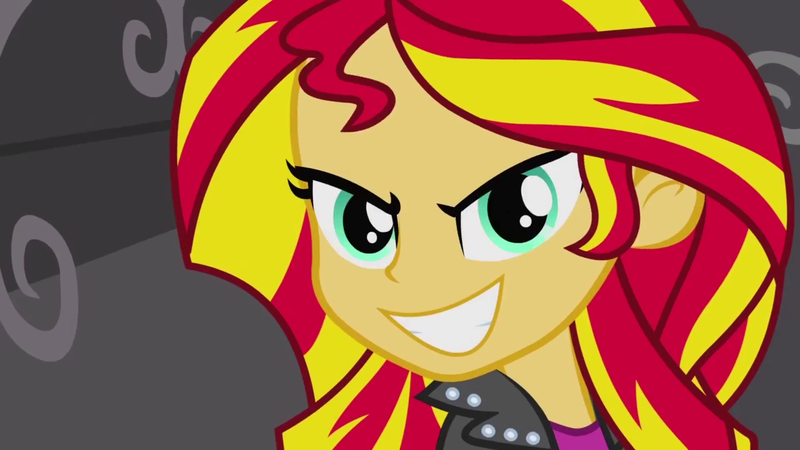 The first one had a very competent villain by the name of Sunset Shimmer, former pupil of Celestia until she turned to evil and murdered your father. Wait forget that last part. Sunset escaped to a dimension close to our own only technology seems to have rapidly evolved faster then that of Equestria and a persons color or their skin is thankfully not an issue. (Now if only we could get that right here). She successfully manipulated the mane six of that world (or five as it were) into hating each other all without anyone the wiser. A woman after my own heart. Only after she tried to enslave that worlds population and return to conquer Equestria in classic “woman-scorned” clichéism did she falter. After a rather colorful beat-down she breaks down and cries..repents..and turns to the light. Everything was fine until that last part. 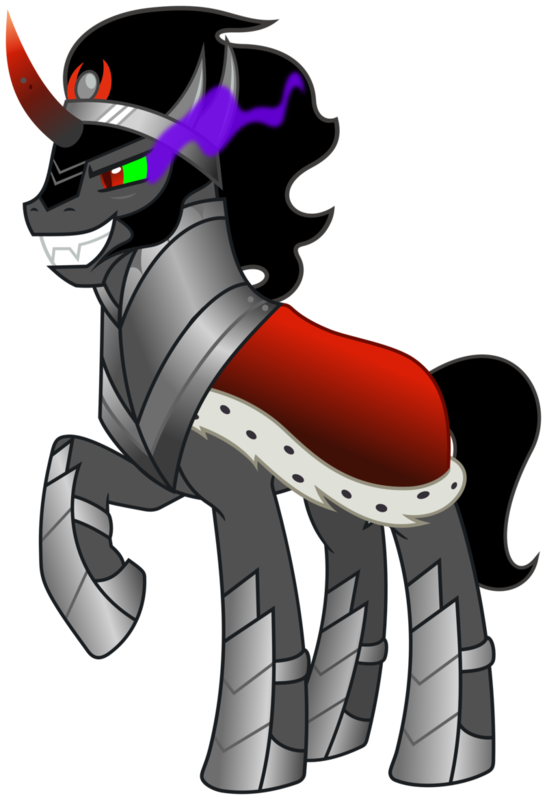 MLP villains have this horrifically consistent trait that makes them all go straight at the end of the episode. Now I can understand the need for that to be for the kids who were originally intended to be watching this, but on the big screen you cant just build up a villain whose done far more damage then most of the ones in the show and then..just turn her into a bawling wimp. Sure the message is all bullies are just insecure on the inside but sometimes..and I know this may be a shock…they don’t turn over a new leaf. 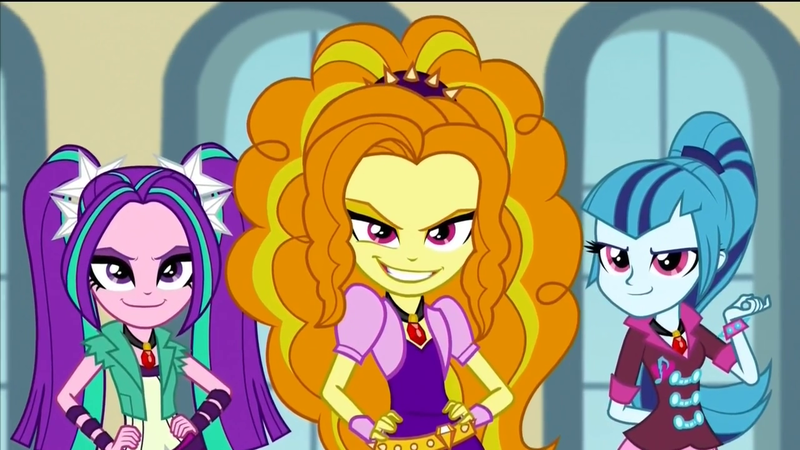 That in mind, we moved to the second movie where Trixie serves as a nice secondary antagonist to a new set of girls called The Dazzlings. Based loosely on the concept of sirens (who if you don’t recall lured men to their death with alluring and often hypnotic songs) these girls were a giant step in the right direction that sunset opened the door to. 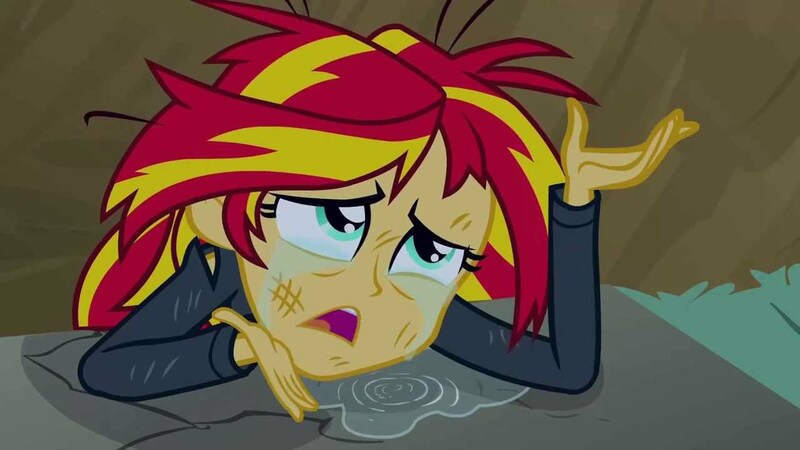 Callous and calculating their leader successfully pulled off what sunset could not (even going so far as to gloat about it to sunset making the newly reformed member of the mane 7 even MORE insecure and unsure of herself) to a degree where they actually win. Sunset Shimmer having doubted herself through the entire movie finally understands the magic of friendship and sings about it. In doing so she unlocks her ultimate mode and joins the others in a clearly not highlighting a new leader in a spin off series moment. 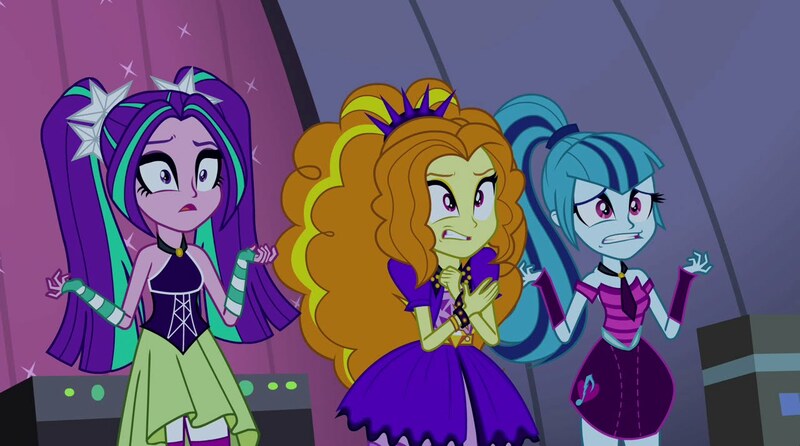 The Dazzlings power is destroyed and without their magic they cant manipulate or.sing well for that matter and they run off. Thankfully they don’t turn to the light side. In classic villain format they run! 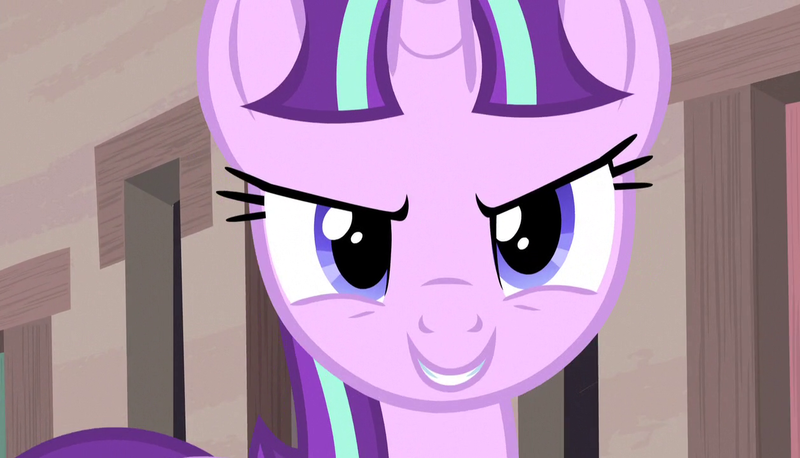 Which brings me to our newest antagonist, Starlight Glimmer! Shes a crafty one alright. One can almost see the evolution of characters if you sit back and watch the seasons in order and the movies. Shes able to successfully convince everyone that without a cutie mark they’d be happy since they’d be equal…and equality is happiness..right? I won’t go into the episode’s morale implications in this post but I will say I was happily surprised at how they turned equality on its head and made me believe something for a moment..that’s another post. Starlight’s motivation is one of the things that I feel is the step in the right direction, namely, we don’t KNOW her motivation. It’s never entirely revealed. That’s the key to a proper villain in my opinion, you don’t dump explanations into the lap of the viewer immediately. You make them speculate, churn their mental butter, and then you slowly see what they like and don’t like as they speculate. The cult like village she rules over is practically perfect in terms of obedience, save a few inevitable day dreamers who think there MIGHT be something wrong with all this equality. The only thing we didn’t see was a plot with some poisoned apple cider everyone had to drink, it was flawless in execution. 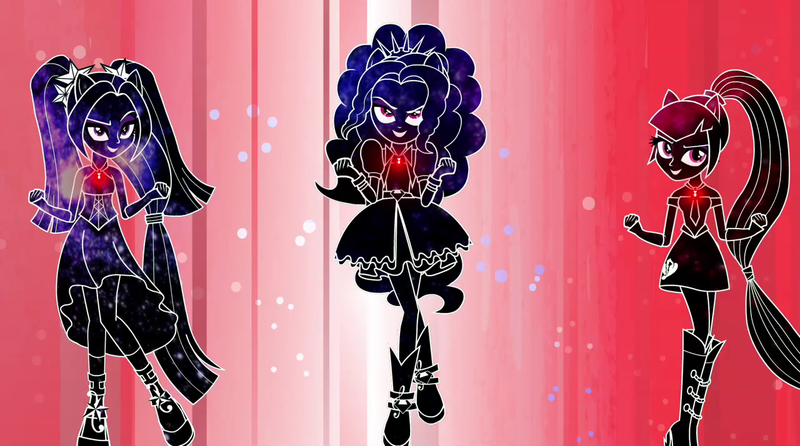 The real clincher when it came to this villain being an evolution was as mentioned before, she doesn’t apologize and want to be friends with Twilight and company, she RUNS. Yes like any good villain when the hero(s) close in on you, you execute your escape plan, which in this case was a tunnel she had prepared we assume just in case this occurred. Despite her attempt to keep all the Mane 6’s cutie marks she ends up being foiled by her former subjects, who use their talents (which include the talent of..skiing? ) to foil her. The final attack which appeared to have the intent of being lethal to the closing masses is a nice bonus. All too often the bad guys are always pulling punches where this girl was about to vaporize the lot of them, only to be deflected by Twilight. Her departure leaves this author hoping this isn’t the last we’ve seen of her as she runs off into the caverns, hopefully to plot her revenge. The entire execution of Starlight was only missing “I’ll get you next time, Gadget, NEXT TIME!” which keeps me from giving this new antagonist a perfect score, per say. The writing team still has some leeway to send us spiraling back into happy happy villain territory, a place I hope we don’t go back to. Thanks for reading my first set of posts, I hope you like and spread my URL about. I’d honestly like to talk more on a deeper level about all elements of the universe. Well it’s the time of the year finally, time for a season premiere of MLP:FIM! The fifth season I might add, and this time, it’s quite a demonstration of the evolution of the series, namely it’s villains! Following that we had the occasional mini-boss, Trixie, who shows us that talking in third perspective can be both silly and effective. Gilda, who is by far the worst possible representative of the Gryphon race (incidentally the only real one we’ve encountered, save backgrounders) and the such. 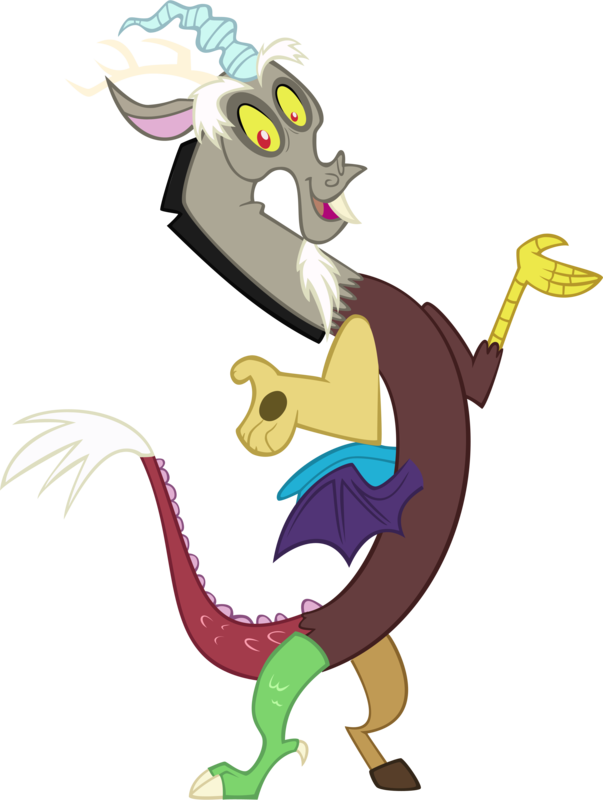 Our next real villain showed us Discord, voiced by the remarkable John de Lancie. Despite being an obvious homage to Q from Star Trek TNG, he was a step forward. He took the idea of chaos and made it both fun and lethal. I think the one thing that sticks out about Discord is his ability to turn each and everyone of our seemingly incorruptible girls (including Twilight) into the antithesis of what they are meant to represent. He does this all while making us still enjoy his antics, much like Q in that respect. Plotting (heh) along with our villains, we got two hardly expanded upon characters. 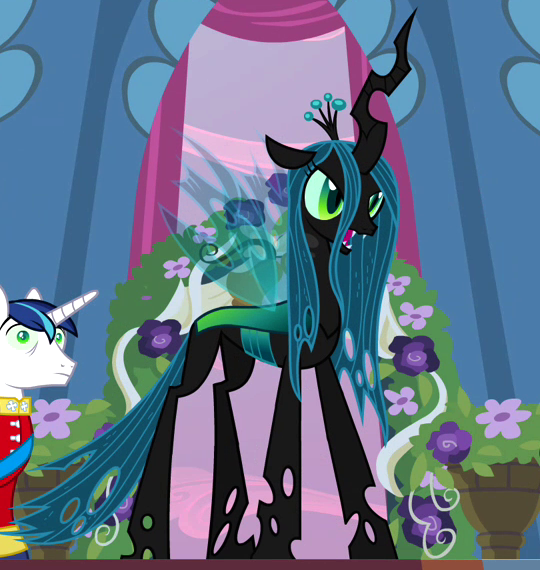 Queen Chrysalis and King Sombra. The former was more of a threat then the King (much akin to chess, if you want to look at it like that) and was almost able to overthrow the entire government (Where was Luna anyway?) and despite the fact they weren’t really expanded on (Yet) I think both have some level of improvement on Discord’s concept. 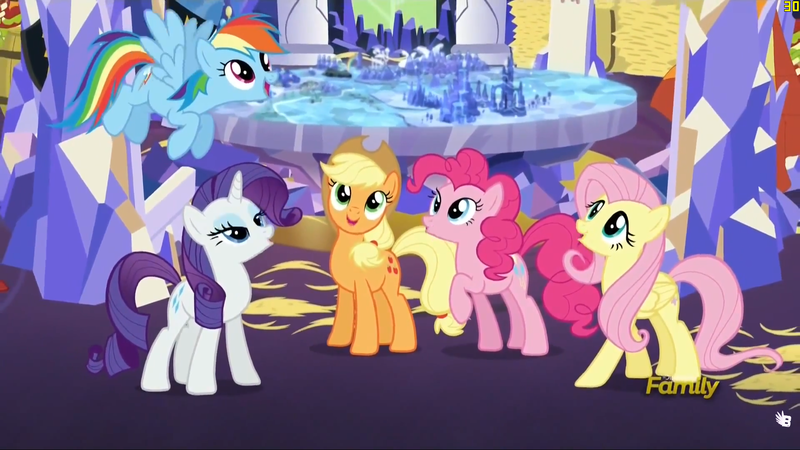 Then we waited, half wondering if we’d all been had by Hasbro as the small glimpse of the new Super Pony forms was the final hurrah for the series. We waited over a year, and finally, we got our fifth season, a hour long (thank goodness, I hate waiting a week) episode that featured our newest villain: Starlight Glimmer! Next I’ll explore why she has been a vast improvement!